It's Tuesday, there is a blustery cold wind blowing, and our Blossom is not well. She has a high temperature and a thumping migraine. Miserable is how she feels. Being a mum is hard when you see your child in pain and cannot seem to stem the tide for them. Cuddles, loving words, medications and lots of water, advice to rest, making sure they keep up fluids and eat some plain but nourishing food. That's all we can do until this runs it's course. I pray that is soon. ...but for a funny story about making toddler pants from t-shirts, go visit Fiona at Bubz Rugz for a good belly laugh! There are a few ladies making items for the Challenge so I've kept it going through August and as long as they have their photos to me by August 31st they will go in the draw for a very pretty "Ruby" charm pack. 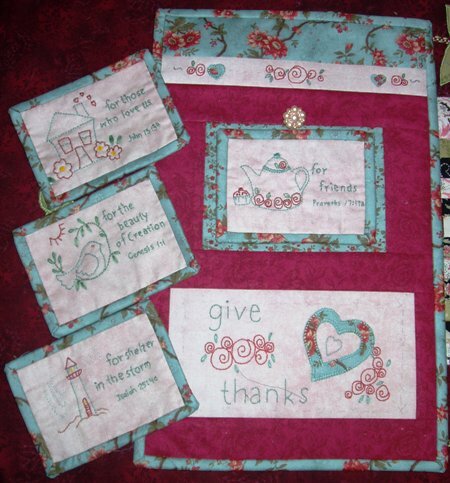 Marilyn from Mardi Meanderings has been making all the verses from my "Give Thanks" BOM. Aren't the fabric choices gorgeous?! 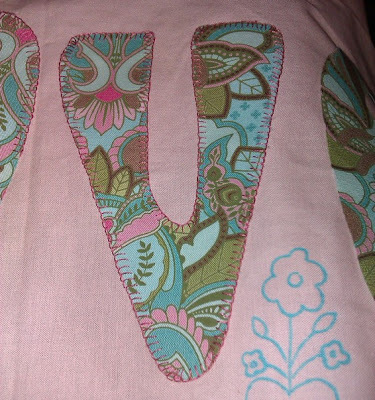 Q: Sue has emailed to ask what pencil I use to trace my designs before stitching. A: I use a Zig Millenium pen .03 in brown. It rolls beautifully across the fabric, and leaves only a thin line - very easy to cover completely when I stitch, even when using just one thread. In the photo below I used just one strand of mid-brown thread for the birdcage in "Fly Free" and you cannot see the traced line underneath. As long as you stitch on the line you'll cover the pen mark. Q: From an anonymous commenter - How do you store your threads? A: I wind all the DMC or Anchor threads onto numbered cards and then store them in number order in plastic boxes specifically sold for that purpose. I store specialty threads in zip lock bags, and then in decorated boxes labelled with the brand of the threads. Apparently Blossom told Kezzie when she first arrived, "Be warned, Mum has this thing about red and white spots!" I do. I really do. Doesn't everyone? Have a lovely evening, and we'd really appreciate a prayer for Blossom's recovery if you're so inclined. Poor Blossom, I pray she makes a quick recovery and is back to her old self in no time. Great post Jenny, full of lots of info! Red and White spots are addictive! Poor Blossom. Hope she'll feel better soon. I'll light a candle for her health. I hope Blossom gets better soon, say hi from me and give her my best wishes. I hope that Blossom is feeling better soon. The poor girl seems to get sick pretty often. That sounds just like my Granddaughter Victoria. You just have to keep on doing what you are doing and she will be her cheerful self soon. I am following both the Stitched Sunday and the Welovefrenchknots blog. I am very impresses with the Stitched Sunday...she has done a nice job. Sending some hugs and well wishes to Blossom. Thank you for all the links, Jenny. I am looking forward to checking them out! Jenny, I am praying for Blossom, especially fervent prayers as we just got our granddaughter back (sixteen years old) from a diabetic coma. I am sure prayers from everyone helped. So, God Bless you, Blossom and get well soon. Beth from Northern Alberta, Canada. Blossom, praying for you to get better and be healthy! Just said a prayer for Blossom. I know what those migraines are like. Not fun! I don't have them as often as I use to. After years, I realized my perfume was one trigger. Then after many more years figured out I am allergic to dairy products. BOOHOO! I miss cheese! Was a bad girl and gave in last week to a pizza fest. Needless to say, I ended up with a four day horrible headache. Keeping Blossom in my thoughts and prayers today for her healing. Aw no...poor Blossom...I am praying dear Jenny! I hope she is well soon. Thanks for all the links and beautiful show and tell - love your cups and saucers, who doesn't love red and white dots??? Poor Blossom, I hope she feels better soon. Get well soon Blossom.Migrains are just no fun eh? Saying a few prayers that Blossom is feeling much better very soon. Thank you so much for letting us all know what pen you use.....my stitcheries should be easier to see from now on. Get well soon Blossom, I suffer from migraines also...they are debilitating. Just love your red cups, Jenny...very cheery. Poor Blossom. Get better soon. I subscribe to those 2 blogs which are new to me. I am enjoying them both. Blossom would eventually feel better. Just relax and take a good rest. I like your post and it's all filled with a lot of craftiness. I love the design of the mug. It reminded me of the mushroom character in Mario Bros. Have a great day!